Now you have your Pizzanatic Supercard you’re ready for its best perk…the delivery! It’s buy 1 take 1! Be ready with your card, they will ask for the last 8 digit if the card and you have to present your card to the delivery man. 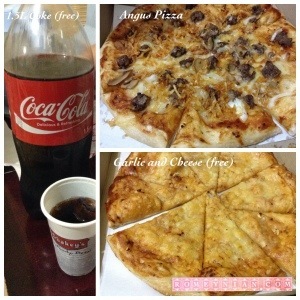 I ordered a large Angus Beef Pizza from Shakeys delivery. Since I’m a holder of a Pizzanatic Supercard I got a free 1.5 coke and another large size garlic and cheese pizza for FREE! It’s all for only Php 583. They gave us an hour waiting time but to my surprise it was delivered in less than 30minutes!